David Glenn Has 30 Yrs Experience Fighting Truck Wreck Cases With Millions Recovered For Clients. Call Today for a free review of your case. If you have become the victim of a trucking accident, it could be a complicated process determining responsibility for the accident. The details are rarely, if ever, as cut and dry as they would be in a simple traffic accident. There are many parties involved from the owner of the truck to the driver and any and all parties in between. Determining the cause usually requires an understanding of how certain things work within the industry. Having an understanding of the common reasons behind trucking accidents and the relationships among those entities tied into every aspect of the truck, trailer and load all help to determine the cause of the accident, whether or not you have a case and how it will be presented if one exists. 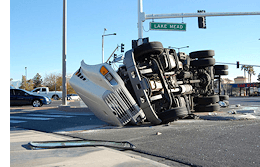 The attorneys at the Glenn Law Firm have tried numerous cases involving truck accidents. They know the industry and are able to get to the bottom of the issue to determine where the fault in the accident lies. Call today for a free consultation. The Glenn Law Firm has helped numerous victims of truck accidents get the compensation they deserved and they can do the same for you. The frequency of truck accidents has increased n average of 20 percent over the past two decades. According to industry statistics, nearly 5000 deaths and 130,000 injuries occur annually due to accidents involving large trucks. Even though trucks are only responsible for about three percent of motor vehicle accidents involving injury, trucking accidents usually result in far greater physical harm and the ratio of deaths to the number of accidents involving trucks is much higher than it is for passenger cars. This is why there are federal laws governing the trucking industry that establish specific standards to which trucking companies, drivers and owners must adhere. They also stand to determine responsibility in accidents. The Glenn Law Firm understands the laws governing each link in the chain and will get to the bottom of what happened to cause the accident but who is ultimately responsible for it. As stated, there are a number of players involved in determining the responsibility of a trucking accident, and while the basic links in the chain are the driver and the owner, there are a number of other entities that your lawyer at the Glenn Law Firm will examine to determine fault. They will look into not just the driver and owner but also the person or company that leased the truck, the vehicle manufacturer, the condition of the tires and other parts that may have become faulty and played a role in the accident and the shipper or persons who loaded the truck (should the cause point to improper loading). In most cases, the various corporate entities involved will argue amongst themselves in an effort to form a consensus. The trucking company may claim the accident was caused by faulty brakes. The brake company might then blame the leasing company for not adequately testing the brakes, and so on. The accident could actually lead to several lawsuits but your only concern is getting compensated for your injuries. The Glenn Law Firm will work with all parties involved to determine a cause and get you a settlement that falls in line with your injuries. The most common causes of trucking accidents are driver error before or during the run, mechanical failure, inclement weather conditions, curves and abnormally designed roadways and traffic signal failure due to disrepair or power outages. Drivers are ten times more likely to be responsible for accidents involving their truck than any other factor. Before looking in any other direction, most companies will attempt to rule out the driver first before expending resources in other areas. Equipment defects are second on the list and can sometimes be difficult or impossible to spot even with a thorough pre-trip vehicle inspection by the driver. However, the vast majority of these problems stem from negligence on the part of the owner to keep all of the truck’s components (including brakes, tires, and electrical system) in safe, working order. Whatever the cause, the expert attorneys at the Glenn Law Firm will find it and hold the responsible party or entity liable for your injuries. Negligence on the part of truck drivers and trucking companies is a danger to all who travel on Texas roads. When such negligence leads to wrongful death, family members of those who have lost their lives have the right to pursue compensation for the loss. Attorney David Glenn aggressively pursues the facts in truck accident cases to determine how these accidents occurred and who is to blame. Trucking companies have teams of lawyers that will use any argument they can to deny liability. David Glenn knows how to counter their arguments to obtain the wrongful death compensation our clients deserve. At the Glenn Law Firm, we handle personal injury and wrongful death cases arising from truck accidents across the Dallas area, throughout Texas and nationwide. David Glenn is an accomplished trial lawyer who can provide you with the skilled representation and compassionate guidance you need. If your searching for a Dallas semi tractor-trailer accident lawyer, Call us today at 817-424-5999 to arrange a consultation and free review of your case.